For the area, see Wales (area). Wales is nation located in the western part of the island of Britain. It does not exist in 1444 start since it is part of the Kingdom of England. It can be released by rebels, by the release nation button or through war. An independent Wales can form Great Britain. 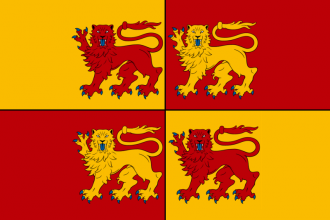 Wales starts out as a part of England thus it's highly recommended if not necessary to play as England in 1444. Starting out as your former overlord gives you the power to ruin England's economy by taking as many loans as possible and debasing currency. It's also suggested to remove any english forts and armies, as this will make initial conquest much easier. After this England will be both economically and militarily wrecked and won't pose a threat later in the game. Upon the destruction of England, release Wales and select 'play as'. With Wales independent expansion into Ireland should be the next step. A viable strategy is to play as England in 1444 and play to win as England. Take Paris as early as possible and build up some land holdings in the Netherlands to give trade power in the English channel. Ally the emperor and try to either conquer as much of France as possible or carve it up into vassals. If these join the Empire, even better. Recruit a diplomatic advisor with at least 2 skill as early as possible, and focus on culture converting as many provinces as possible to Welsh. When deciding which to convert, try to create bridges to Edinburgh and Paris. Try to build up a large army, keep at least 40 transports near Britain and have a good treasury; at least 10,000 ducats. When in the Age of Absolutism, you may get the English civil war disaster, which dramatically increases unrest. When the disaster starts ticking, move your capital to somewhere Dutch or Flemish and abandon your states in Great Britain. You should now be able to culture shift to Dutch, which means that you can more easily get separatist rebels in your British culture group provinces (Welsh culture). When these rebels spring up, let them occupy provinces which you have culture converted as this will give Wales a core on them, but once they have got the core be sure to take them back. You do not want your country to break and Wales to break free of you. Ideally Wales should now have cores on the capitals of five of the Six Nations: Meath, Glamorgan, Lothian, London and Paris. When they have done this, smash the rebels. Now if you release Wales, they should get a decent amount of land and most of what they need for the achievement without having to fight late game French. Before you do this, you should ruin England. Destroy all her forts except one in Great Britain, ideally a level 2, in a province that still has English culture. Build a lot of mercs to burn money, leave them standing until there is no cash left in England's treasury. All her states except the Dutch capital state should now have been abandoned so she has low manpower and low sailors. If you have colonial subjects, release them - you don't want press-ganged sailors arriving. Keep one good alliance - Austria perhaps - to keep Spain or remnant France at bay as being crushed at this stage can ruin everything. When England is ruined, then release all vassals that don't share cores with Wales. If you can create client states, even better. Don't worry about diplo slots, release everything but don't cancel vassalisation. Gaeldom, Irish minors, Flanders and Holland should be falling out here. Disband the armies and navies. Now release Wales. Remember to click "Play as released subject". You should have a good heartland, nice and developed, and a lot of England's other subjects as potential allies with high liberty desire. Declare war as soon as you have an army of at least 20k. Don't ally anyone on the continent before this war - England's other ally will crush them and you will lose warscore because of it. However, if you can occupy all of Great Britain - including England's one fort - you should easily be able to demand independence. Congratulations, you're out! Cymru am Byth! Now grab Rome with imperialism CB and make Max Boyce proud. This page was last edited on 22 December 2018, at 13:04.